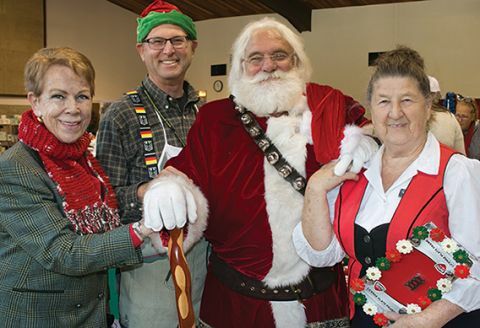 Festival founder Heidi Cadena (left), Pastor Richard Reimer and vendor Inge Inge Baylocq welcomed Santa Claus to the Walnut Avenue church gymnasium. CARMICHAEL, CA (MPG) - Chestnuts roasted, sausages sizzled and strudel were enjoyed at American River Community Church’s third annual German Christmas Fair last weekend. While Pastor Richard Reimer donned holiday apparel – elfen hat and lederhosen – a traditional Santa Claus granted Christmas wishes. Attendance was boosted by the Sacramento German community, for whom gift markets – fragrant with cider and sauerkraut – are beloved Christmas traditions. Church member Heidi Cadena began the event three years ago as a fundraiser for the congregation’s ministries.